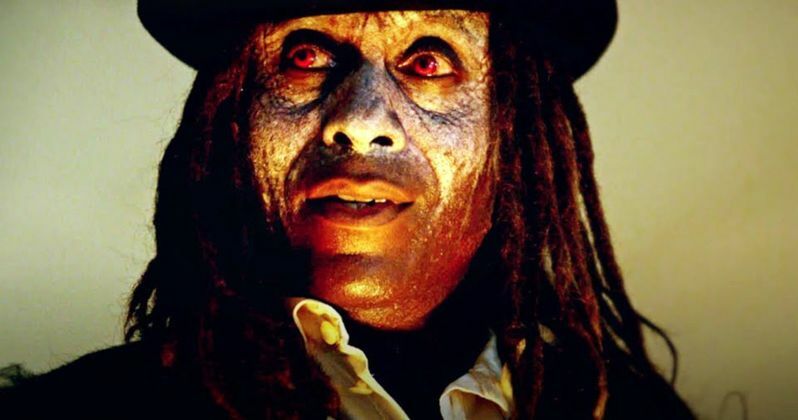 Papa Legba made a brief appearance in last night's episode of American Horror Story, as does another former member of the Coven. With nothing less than the fate of humanity hanging in the balance, the witches mount a united strike against Michael and his allies. Last night's episode of American Horror Story: Apocalypse titled Traitor is set pre-Armageddon, revealing more of the events that transpired before the bombs dropped. It's compelling storytelling, for sure, but since we already know that Cordelia Goode's plans will fail, it's kind of hard to get too hopeful. Unless, of course, this season is setting us up for a Terminator-type scenario, one where the future isn't set in stone, but rather nebulous and malleable. We learn that, before having her mind scrambled and taking on the persona of a talk show diva, Dinah Stevens was the Voodoo Queen who took over after Marie Laveau (Angela Bassett) was offed in American Horror Story Season 3. We see her using her powers to take down adulterers as a psychic hitwoman. After Voodoo-dolling a woman to death, she makes a smoothie out of the corpse's heart, a chicken foot, and some strawberries to make it go down easier. Down a cheating husband's gullet it goes, and he'll never get hard for a woman besides his wife again. It's not glamorous work, that's for sure, which is why Cordelia is able to recruit her into the cause of taking down the teenage Antichrist. The fading Supreme wants a meeting with Papa Legba, the dreadlocked keeper of the underworld who we met previously in Season 3. She agrees to arrange meeting but warns Cordelia she'll require a hefty broker's fee: $100K! It's steep, but at least she doesn't have to drink an organ and chicken foot smoothie. Enter Bubbles McGee; it turns out Mr. Gallant's nana is a member of the Coven and most likely had her brain scrambled like Dinah, Mallory, and Coco before the bombs dropped. We have to assume she would have been resurrected after the poison apple party had she not previously been murdered. We learn her backstory (she's an actress currently making a crappy horror movie) and her power (the ability to read minds) as she's quickly enlisted into the anti-Antichrist brigade. She accompanies Myrtle Snow back to Hawthorn and promptly eavesdrops on the thoughts of Chancellor Ariel Augustus and Baldwin Pennypacker, learning of their murderous intentions (not to mention their act of fratricide against John Henry). Later, as they plot to poison the witches, their busted by Cordelia and other powerful members of the Coven and promptly sentenced to death for his many transgressions. Meanwhile, Dinah has summoned Papa Legba for Cordelia (in a ritual that was extremely similar to saying "Beetlejuice" three times) and if you though Dinah's prices were high, wait until you hear what Mr. Red Eyes requires. If Ms. Supreme hopes to recruit Papa for her cause, she needs to offer up some souls. But not just one or two soul, he wants all of the Academy's witches. Papa even tries to persuade her by dangling the tortured soul of Nan in front of her. Cordelia balks, but Papa can read her poker face, and retreats back into the underworld. Damn Papa, what do you have to go so soon? Here comes the game changer: Since Michael won't officially become the new Supreme until Cordelia dies, the witches pull a "Hail Mary", or, more accurately, a "Hail Mallory". After exhibiting some extraordinary psychic-surgery skills while saving Coco from choking on a Snowball, the posse deduces Mallory, not Michael, is the real new Supreme. To prove it, she's subjected to the Seven Wonder, and she passes with flying colors. Now, the witches have an opponent who can challenge Michael Langdon from ascending (assuming he ever returns from playing Tarzan in the wilderness). For the resurrection portion of the Seven Wonders, Mallory brought John Henry back to life; when he describes how he became a pile of ashes, Cordelia and company, er, Coven learn of Mrs. Meads involvement in the conspiracy to usher in Satan's reign. It turns out Anton Levey's lieutenant is a wayward member of the flock, sorry, Coven. The sisters (along with double agent warlock Behold Chablis) set up a take-down at the grocery store where Mead shops for cloven hooves. She's taken to the L.A. Reservoir and burned at the stake alongside Ariel and Baldwin, who have been deprived of their mouths like that scary girl from Twilight Zone: The Movie. The Black albinos douse some gas, light some torches, and the trio ignites before the congregation of witches. Mead laughs as the flames lick her face. It's kill or be killed, time for the Coven to unite and strike, and they set course to confront Michael for an epic battle royale. Previews for next week's episode will fill in more of his evolution from bratty man-child to bratty Spawn of Satan as we continue our march into Episode One's titular Apocalypse. Or do we? Check back next Thursday for another recap; American Horror Story: Apocalypse airs on FX.